NGA2 which is what Openreach is calling the successor to the existing FTTC led roll-out is closer to becoming reality and by the time FTTC hits its tenth anniversary in 2019, a G.Fast roll-out is likely to be well underway, with G.Fast providing the speeds that Openreach believe people will need through to around 2025 to 2030. A presentation at a UKNOF meeting(UK Network Operators Forum) revealed that in addition to Gosforth and Huntingdon as trial locations, parts of Swansea will be taking part. The trials will be looking to pass some 4,000 homes and trial two options G.Fast and a new faster Fibre on Demand product. The G.Fast product is currently being touted as an up to 330 Mbps downstream connection with 30 to 50 Mbps upstream speed, with a bandwidth priority of 80 Mbps across the Openreach fibre element. The full fibre FoD option will look at 500 Mbps to 1 Gbps type speeds. The trials which are set to last for a good few months starting this summer are likely to be interesting, but do not get too excited as since things stand the service will cease once the trial is over, i.e. this is a real trial not a soft launch of the full product. There are other developments still on-going for existing VDSL2 services, such as the Single Order GEA service, which will do away with a voice connection all the way back to the exchange. It is looking very likely that which ever retailer is pushing the development is looking to use a VDSL modem/router that re-creates the phone socket, since Openreach are developing an isolating faceplate that will pass through VDSL2 to the modem/router, while still supplying voice connectivity to extension wiring in a home, without the voice signal leaking onto the Openreach copper network. 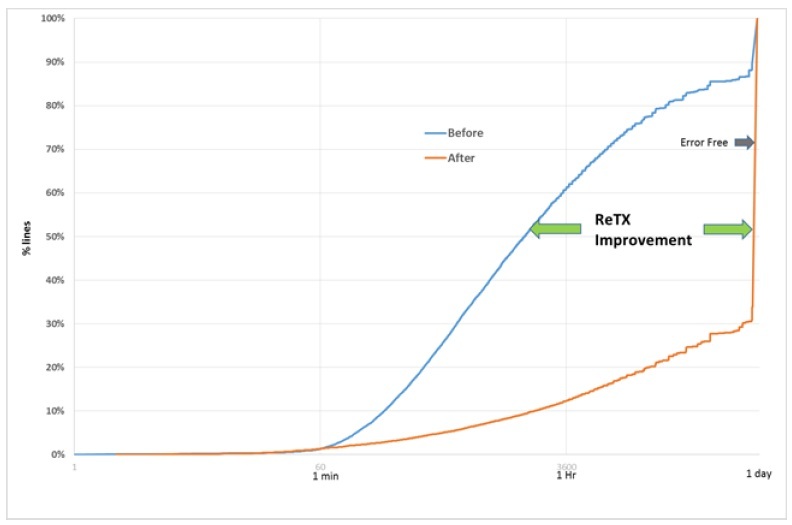 The ReTx (G.INP) trails got some exposure over the problems those who have ended up with ECI hardware on a Huawei cabinet are encountering, but the chart above shows why ReTx has been pushed on, it can give a 1-2 Mbps throughput boost and importantly for video streaming and gaming it reduces the number of errors people are experiencing. Vectoring which is under trial and is increasing its footprint should give a lot of the speed people have lost to crosstalk back, but this is proving to be at the expensive of long sync times, generally three times longer than usual for VDSL2 (with vectoring around 130 seconds), hence why keeping error rates low is important. One development that we have been seeing happen more and more is copper rearrangement to put lines onto more logical cabinets, though this is still very dependant on the coverage target in an area and levels of manpower, so even if you think its perfectly logical for you to be moved attempting to request it as an individual will fail. It would appear that in the next two to three years we may see the number of street cabinets grow by an extra 3,500 as more PCP with fibre twins (or combined units) are deployed to resolve clusters of long lines. In a couple of cases we believe we have encountered people where the checker gives two different answers i.e. one for the address and one for the phone number as a result of new cabinets, though mainly this is an EO problem as cabinets are added. For those who think the checkers are always wrong, and we have reported in the past that the Openreach speed estimates are based on the distance to the DP (e.g. final telephone pole), which means premises stuck down a long lane or drive will currently not have this extra long copper distance taken into account. The Openreach checker presumes a 5.5dB loss for all 29 million lines between the DP and premises, but new data will be used to refine this and will be an important part of the work towards rolling out G.Fast to ensure that decisions on where G.Fast nodes are located is sensible in terms of providing the best speeds, as well as trying to avoid disappointment for those who area a FTTC service and get well under the estimated speeds. How painful is that going to be for customers (and ISPs) when they've had possibly 200-330Mbps, or even up to 1Gbps, and then are back to at best 70-odd on a normal package. (Continued) surely people who have experienced the higher headline speed and see an alternative that is available will be tempted to jump to that. Good god, I would hope we would have full FTTP by then. All this farting around is hurting the economy. Just put HS2 or 5 or whatever version they are on now, to one side and put the cash into FTTP for all. We can do the bloody trains later. @fenlandbroadband - I think where they are trialling the G.Fast, once over they would be able to get FTTP speeds or close to it due to being fibre to their pole and then using copper from the pole to the home, so I would assume they should be able to get close to the 330Mbps speeds, infact I am sure BT will either offer them the choice to either get the remaining distance from the pole to the home as fibre or allow them to pay the remaining fibre putting them down as FTTP. The problem as always is that G.fast has to be paid for. I think that when superfast has been deployed we should look at other ways of funding G.fast. A way has to be found for BT and other providers to get a return on their investment. A possible solution could be infrastructure charges based on council tax banding. A one off charge per property when G.fast was adopted. Using council tax banding would level out the return on investment between urban and more affluent rural areas and make all areas viable. Is it just me confused as to why Openreach don't seem particularly interested in testing/deploying G.fast/FTTrN for use in MDUs? A whole lot of us have comms rooms in our buildings which would be natural places to install the equipment. OR would get nice short line lengths, which could be further shortened by putting them on different floors of the building itself (whether just for trial purposes or not). I mean, it won't be quite as fast as the FTTB that the Hyperoptic's of this world can provide, it'll likely be a whole lot cheaper to deploy due to being able to reuse most of the wiring, and give much nicer speeds than they could otherwise get with FTTC. 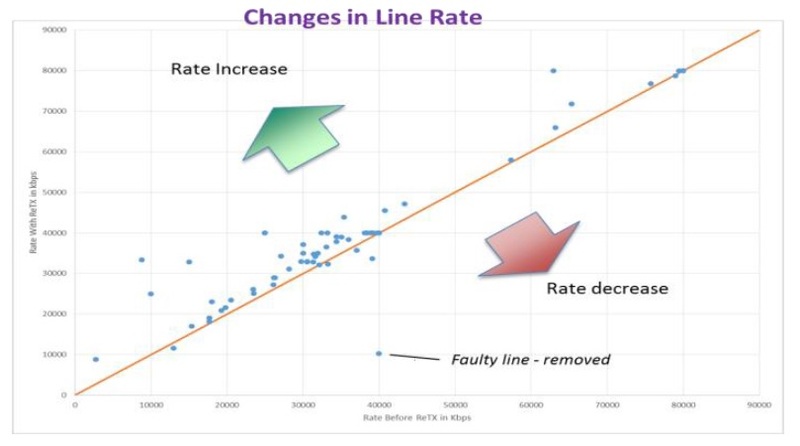 Surely the savings on not having 100's of engineers troubleshooting copper line faults EVERY day and the administrative/operational overhead of customers/ISP's not raising faults about degrading speeds goes a long way to start rolling out FTTP? Maybe not...? The last roadmap I saw from BT wholesale suggested trials of FTTB this quarter, alongside further trials of FTTRN. From BT's perspective there are a few things they have to watch for - the main thing being that no subscriber in the MDU can stay on the original FTTC from m the cabinet. They'd have to move over, whether they like it or not. @ahockings: "All this farting around is hurting the economy". Citation needed, please. Our economy seems to be doing very nicely in comparison with just about all our peers. If it was doing any better it'd be freakishly good. "... Using council tax banding would level out the return on investment between urban and more affluent rural areas and make all areas viable." Absolute Cow Dung, you seem to make an assumption that rural areas are more affluent, some may be but the vast majority of people living in rural areas could not afford to buy property in say Chelsea or Mayfair. Your argument has little merit as we have already been paying a premium (approx 5x more) for not being in an urban area, whilst getting a far worse (slower) service! You miss my point. By using council tax banding customers in more expensive properties would pay more. Having faster broadband will also add to the capital value of the property. Central London is clearly an exception. The trouble is that is that it does cost more to provide our broadband in rural areas. We need faster broadband and we have to work out a way of paying for it. @chilting Faster broadband only increases property prices if only some people have it. If your plan worked then everyone would have it and therefore it would not have any increase to property prices as it would be a level playing field. Council tax is already being used for BDUK as well as income tax. It is true that it would become a level playing field but we are bound to get more innovation and the process could well repeat itself. I am not suggesting using taxes to fund G.fast but looking at ways it can be done commercially. I am suggesting basing the infrastructure charge on the property itself and the size of the property. It would become a part of the capital value of the property. @chilting the problem is that there are people for which "superfast" is not a requirement and your suggestion is that people should pay whether they want it or not. Why should cost of house affect cost of broadband? They are not related to me. Maybe all broadband packages should be priced by you presenting yourself to a pricing committee who decide what you can afford to pay? Well if Openreach want an MDU to test in, I live in a building opposite one of their exchanges with no FTTC though no EO lines either. Having said that, the amazing uphill battle I've been having to try to even get our building management to let Hyperoptic do a survey, probably doesn't bode well for that..